You wouldn't be wrong, Brad, but I decided to forgo the ice cream for a glass of red wine instead. There's a definite trend in my diet from good to worse as the day progresses. BTW...Did anybody tell y'all how many Moon Pies Rich and Paul and Truman and Chuck had Friday night in Virginia? I only had ahem... remember having ...one, but that family-sized box sure was almost empty Saturday morning! Virginia? Isn't that a long ways from home? Last weekend in September we got together - I was moving from Seattle to Jacksonville by way of seeing those guys in Virginia for a weekend and my folks in Tennessee for a couple of weeks. I see. I thought you still lived in Seattle. What are you going to do about mosquito's the size of hummin' birds? No - my job in Seattle was over in mid-July...I gave it til end of September but I wasn't finding work. All the jobs for me at the moment seem to be on this side of the country for some strange reason. Seattle is very much a Microsoft SQL Server kind of town and I'm an Oracle person. I know I was only there nine months (west coast a total of 14 months) but it never felt like home for me, the local Brokie presence notwithstanding. About the mosquitos, I dunno...working on mold at the moment. Not sure about spaghetti (or baked beans) on toast being an Aussie thing (probably is though), but it sure is a kiwi (New Zealand) stand by staple . 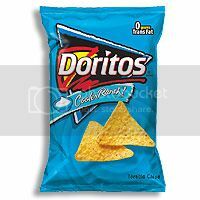 Hey whats Doritos and please tell me what does Chunky Monkey flavoured ice cream taste like?? ?